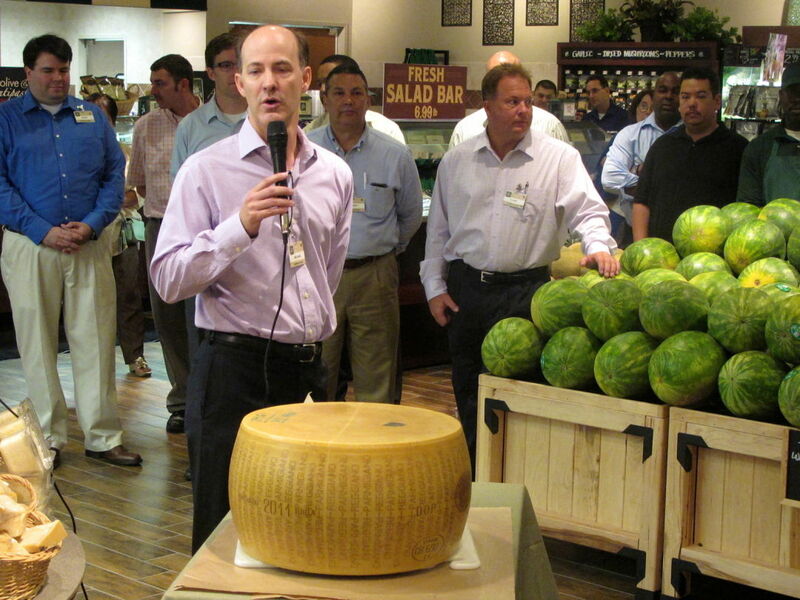 A giant Parmesan wheel was sliced in half, and cheese samples were handed out at the opening ceremony of Houston's first Fresh Market grocery store this morning a little after 8 a.m. in the former Rice Epicurean location at 2617 W. Holcombe. COO Sean Crane came down from The Fresh Market's corporate office in North Carolina to deliver the opening remarks. The chain started with one mom-and-pop specialty store in Greensboro, North Carolina in 1982. 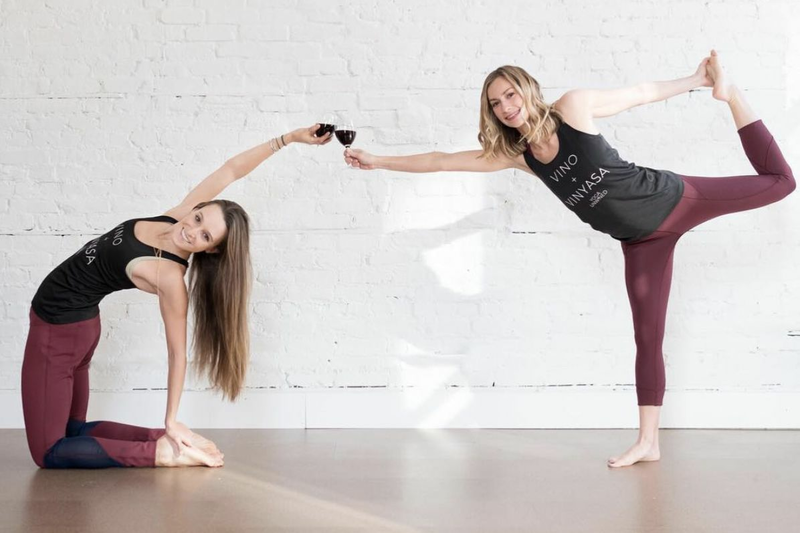 The company has thrived by bucking the bigger-is-better trend, offering personal service in smaller stores with a warmer atmosphere than warehouse-size grocery stores. 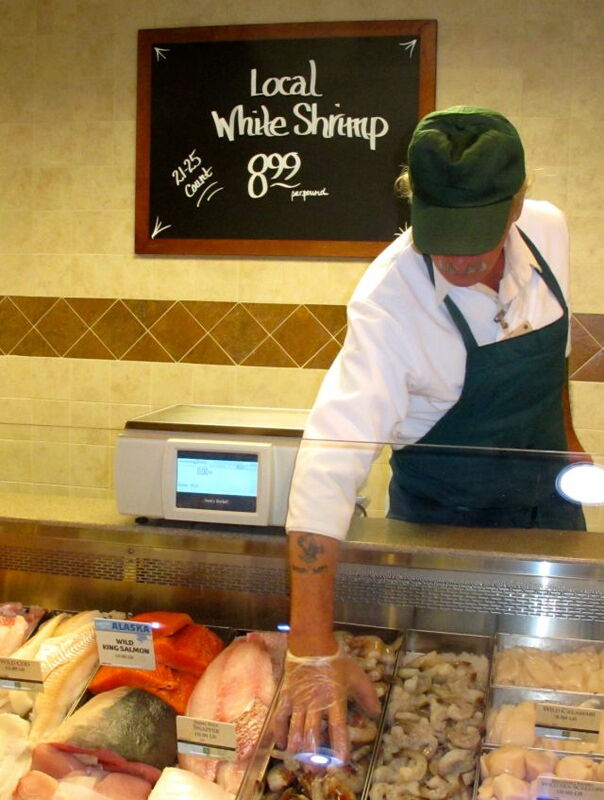 I was delighted to see Texas shrimp on special in the seafood department; there are very few grocery stores in Houston that even differentiate local white shrimp from imported farm-raised white shrimp. Sustainable seafood featured in the case included Gulf grouper. If The Fresh Market seafood department would just replace some of that salmon and tilapia with Gulf fish, we would really get excited. 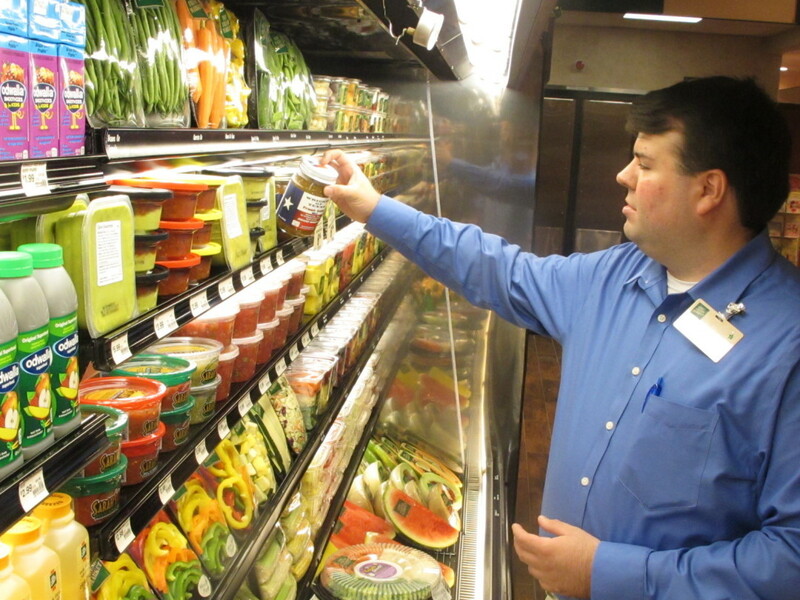 Store manager Blake Atkins, who relocated to Houston from a Fresh Market location in Atlanta, took me around the store pointing out local products. Most of the items in The Fresh Market stores in Houston will be the same ones carried in the chain's other 134 stores, he said. This makes for some strange selections--you can buy fresh salsa imported from Florida, but not the local Arriba brand. (If you are looking for Low Country Gumbo in a jar, you're in luck.) The stores are eager to start adding local items as the company develops relationships with local producers. The Fresh Market joins Houston newcomers Trader Joe's from California and Sprouts Farmers Market from Arizona in the grocery game. 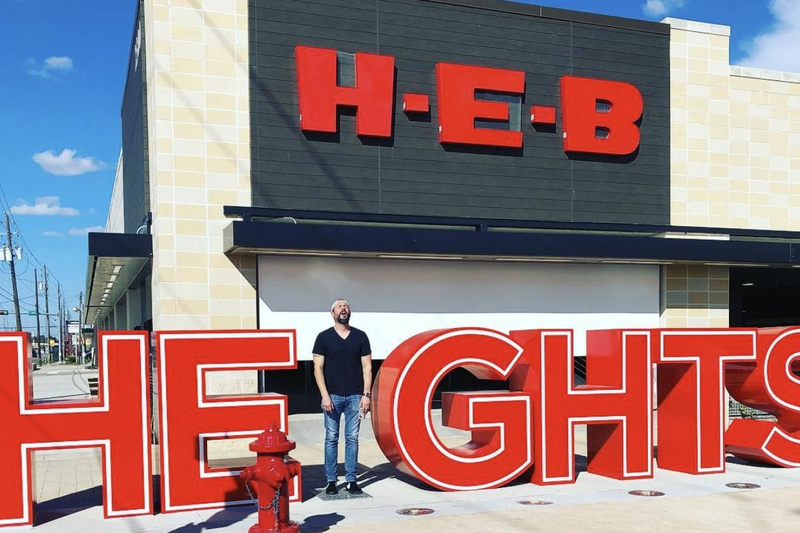 The challenge for grocery stores entering the Texas market is competing with homegrown giants like HEB/Central Market, headquartered in San Antonio; Whole Foods, headquartered in Austin; and Houston's own Fiesta. The Texas chains have a huge advantage in understanding the tastes of the locals. 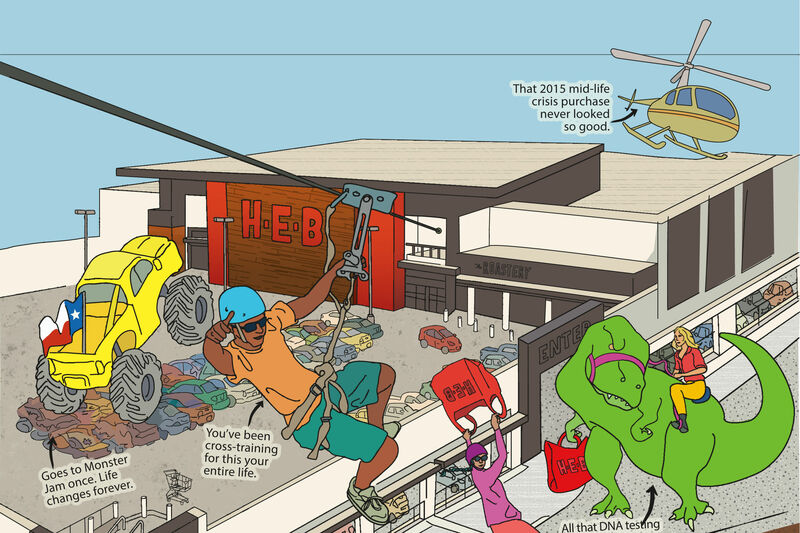 I asked Sean Crane why The Fresh Market chain chose Houston for its latest expansion. "Houston is such a great food city," he told me. "And the Rice Epicurean opportunity was too good to pass up." The Fresh Market will open three more stores in former Rice Epicurean locations over the next month. Check out the upcoming grand openings to sample products and take advantage of special bargains.